SOOSAN Heavy Industries, which has been an integral part of the construction machinery industry of Korea since its establishment in 1984, is a representative enterprise that made its mark internationally with its hydraulic breaker brand ranked in the global top 5. SOOSAN Heavy Industries, a name that is trusted by the world, is a representative enterprise of construction heavy equipment driving the industry forward throughout the world. Based on its leading-edge technological process, SOOSAN hydraulic breaker boasts a strong hitting power with the highest power-toweight ratio in its class, guarantees the durability by installing a built-in valve, and saves the maintenance cost with composition of parts of about 80% level compared with other companies. In addition, SOOSAN Heavy Industries has become a global top-5 hydraulic breaker brand by grafting the modernization of production facilities, such as the super grinding technology, robot welding technology, its own heat treatment technology of 30 years, etc., onto such technologies. SOOSAN crane dominates domestic market share of the truck-mounted crane regardless of the type of domestic and overseas commercial trucks with excellent mounting performance and the largest product lineup in Korea. SOOSAN crane, which guarantees excellent lifting capacity and durability with convenience capable of lifting work only with easy operation, crane boom design technology of the minimum weight in the same class, and selection of high-tensile-strength boom, minimizes shaking of the boom while in operation through the technology of minimizing the gap between booms. In addition, SOOSAN crane maximizes the user’s work effi ciency as it facilitates double operation work that occurs frequently during crane work and also makes the operation more efficient with Korea’s first hydraulic balance optimization technology. Also, SOOSAN crane reduces maintenance costs by providing optimal fuel effi ciency with introduction of the eco system and load sensing system uniquely in South Korea. 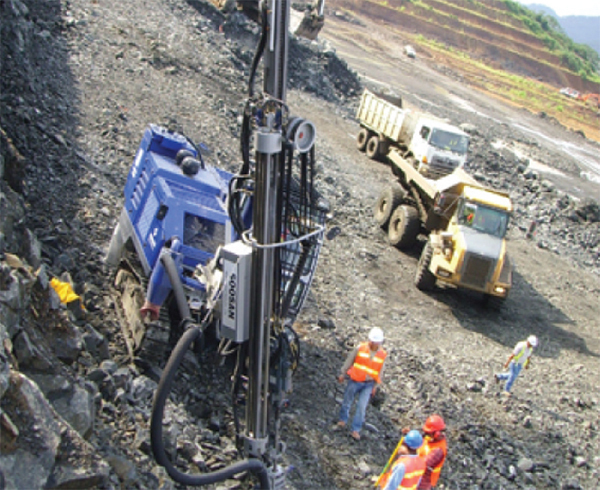 SOOSAN hydraulic drill is equipped with a drilling capacity and control system that can optimally respond to various qualities of rocks or changes of working conditions with its independently developed drifter technology by utilizing the core technology of SOOSAN Breaker accumulated over the past 30 years. Like this, SOOSAN hydraulic drill with excellent drilling efficiency has better fuel consumption rates than other domestic and foreign competitors, has outstanding work capacity even in the environments of bare ground, tunnel and special work environment. Moreover, it off ers a maximum working range compared with the same class of up and down 60/40 degrees and left and right 45 degrees, respectively. In addition, SOOSAN is improving its product competitiveness through the ergonomic design optimized for the operating environment and the structural design convenient for customers’ maintenance. [INQ. NO. 1807M16] NEOBUZZ Demolition Tools Co., Ltd. is a Korean company specializing in designing, manufacturing and selling hydraulic breakers & excavator attachments. It exports to as many as 30 countries including those in Europe, the Middle East, Asia, North America and CIS. NEOBUZZ Hydraulic breaker delivers strong impact power, excellent stability & durability, easy maintenance and compatibility. NEOBUZZ Hydraulic Breaker type includes Silence (Box) type; Top (open) type; Side type; Backhoe Loader type; Skid Loader type. NEOBUZZ provides a full line of Mini breaker NB10 (for one-ton excavator) and Large breaker NB500 (for 60ton excavator). NEOBUZZ Demolition Tools is always open-minded to all opinions of customer’s, and has been developing through listening to customer’s feedback. The fast-growing Korean company in earthmoving business also strives be in a leading position through continuous research & environment ally friendly unit development with its mission in mind for customer’s satisfaction. Daemo ever since its founding in 1989, has solely been committed to developing and exporting attachments for excavators, becoming one of the nation’s leading construction machinery manufacturers in terms of accumulated experience of technology development, production scales, and export competency. Now Daemo exports its versatile construction machinery through its three overseas branches in the United States, China, and Belgium and its network of overseas dealers in more than 50 countries. Daemo set a goal of accomplishing total sales of KRW700 billion for this year, gaining momentum from last year’s prominent performance of RW600billion in total sales and $35mill. in total export amount. 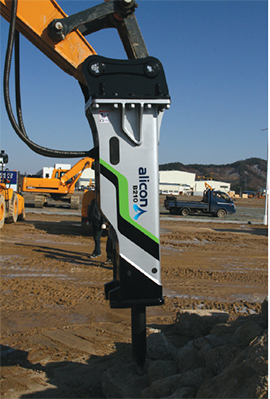 Among many of its top-notch construction machinery devices, the Alicon hydraulic breaker is comparatively the latest, highest grade product. This breaker “Alicon” is designed using technology accumulated over the past 25 years. The total power control (TPC) system applied in it can proficiently control the power and speed itself, depending on the thing required to be operated. This latest breaker has the so-called ABF (Anti-Blank Firing) system that can automatically sense the unnecessary target of firing and stop its operation at the same time. It also exhibits the top-level efficiency in operation and durability with its built-in unique operation mechanism that enables operators to conveniently control the exactly required operational functions depending on characteristics of workplaces and in consideration of users’ convenience. Current export destinations extend to over 50 nations. Some African regions are emerging as potential new partners of this company. As one of the world’s largest and oldest manufacturers of hydraulic breakers, Soosan has been committed to the development and manufacturing of quality products and product support since its establishment in 1984. Now Soosan accounts for over 35% market share in the domestic market in the sections and has seven overseas operationsin strategic locations across the world to support 151 dealers in over 70countries. In addition to hydraulic breakers, it also manufactures truck-mounted cranes and surface blast-hole drill rigs. The company’s STD series of hydraulic crawler drill rigs have been developed to be the reliable top hammering drill rigs for surface blasting in quarry and civil work environments. They are comprised of undercarriage, feed, boom and power unit. These components are powered by a water-cooled Cummins diesel engine. They are equipped with a safe and comfortable cabin (ROPS & FOPS) with wide visibility and easy operation system using joysticks. They also have a simple rod changing system and advanced Soosan hydraulic rock drill. Since the first breaker rolled out from its factory back in 1984, the ingenious and patented design of Soosan breakers have received recognitions for its superb performance from worldwide customers. It offers a wide range of breakers compatible with carriers, ranging from 0.8 ton to 90 ton class, suitable for various applications; such as overburden removal, primary and secondary breaking, asphalt, concrete structure demolition, trenching, ground excavation, foundation works, recycling, landscaping, etc. Filed Under: KOTRA Tagged With: Crawler Drill, Hydraulic Breaker, Soosan Heavy Industries Co. Ltd.